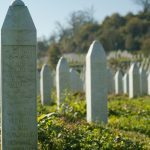 A group of Forensic experts returned to Bosnia 20 years after the first mass graves were excavated. As well as returning to Visoko, where they were based, they visited Sarajevo and the Potocari Memorial Centre where over 6,000 victims are buried. Here three of them talk about the experience.